The Green Basilisk Lizard – Download Free Science Worksheet Printables for Grade 4 Kids. Grammar school kids in Grade 1 to Grade 5 will enjoy this free word game about the green basilisk lizard as a reading comprehension activity. Pre-K and Kindergarten kids can use this hidden and missing words puzzle as a listening comprehension game. Our easy science worksheets can be used at home or in school. Kids will enjoy learning green basilisk lizards facts with this fun word search puzzle. This word search puzzle game activity sheet can be used as an after-class activity, homeschooling science worksheet as well as for teachers to supplement their science lessons. Sometimes, the green basilisk is also referred to as the “Jesus Christ Lizard.” This is because the green basilisk is a lizard that runs on water. Download the printable word search worksheet to teach your kids more about the green basilisk. EasyScienceforKids.com is the best great parent and teacher resource for science activity sheets. Check out all our other free word games and science for kids worksheets. 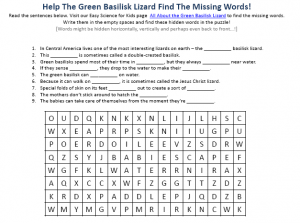 [sociallocker]Download fun hidden words puzzle worksheet about the green basilisk lizard. Download the Green Basilisk Lizard Worksheet! Like the Green Basilisks Lizards Worksheet? Find lengthy facts about the basilisk lizards here. Declan, Tobin. " Green Basilisk Lizard - Download Free Science Worksheet Printables for Grade 4 Kids - ." Easy Science for Kids, Apr 2019. Web. 23 Apr 2019. < https://easyscienceforkids.com/green-basilisk-lizard-download-free-science-worksheet-printables-for-grade-4-kids/ >.